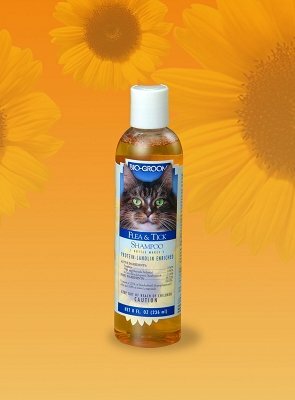 Bio Groom Cat Flea and Tick shampoo is a conditioning concentrate that contains pyrethrins for effective flea, lice and tick control. The protein and lanolin in this shampoo helps condition skin and coat, prevents dryness and gives the coat body and a deep down luster and sheen. Coat dries smooth, manageable and tangle-free. pH balanced, mild, rinses out completely, leaving the coat smelling fresh and clean.